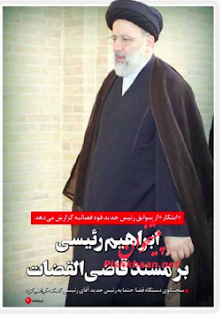 Ayatollah Ali Khamenei the leader of the Islamic regime in Iran has chosen Ebrahim Raisi , one of the infamous judge, to the top position of the Judiciary Power. Ebrahim Raisi is known as the mass murderer of the political prisoners during the summer of 1987-88 . Khamenei has congratulated Raisi for the position.